An Obese Florida woman has been arrested and charged for killing her cousin. 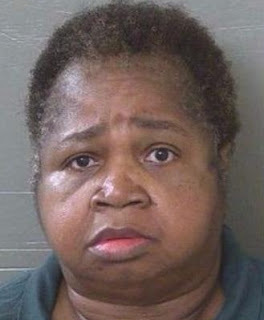 A 325-pound (150-kilogram) Veronica Green Posey, 64, from Florida, United States, has been charged with killing her 9-year-old cousin by sitting on the child as punishment. She was arrested and charged with homicide and cruelty toward a child, The Pensacola News Journal reported. The Escambia County Sheriff’s Office report identified Posey as the girl’s cousin. During the punishment, Dericka told Posey and two other adult relatives, who are identified in the report as the girl’s parents, that she couldn’t breathe. When Posey got up, Dericka wasn’t breathing. Authorities said Posey called 911 and started Cardiopulmonary resuscitation (CPR) on the child. The arrest report said Grace Joan Smith, 69, and James Edmund Smith, are charged with child neglect. Grace Smith called Posey, who is her niece, to her house to help with disciplining the girl, according to the report. She told investigators that Posey hit the girl with a ruler and metal pipe before the child ran to an armchair. See her wicked burger face,rot in jail idiot . No, you mean 325 pound gorilla! What a beast! Foolish parents. They cant train discipline their child and needed a mammoth to help discipline d child.